An Anguilla honeymoon is sunny, tropical, and ideal for the couple who craves the ultimate relaxation. 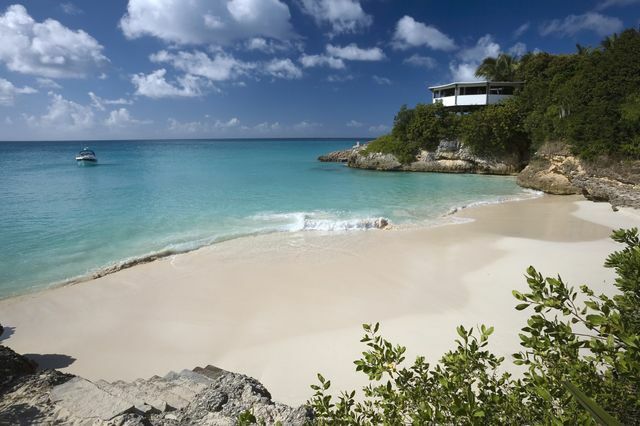 An Anguilla honeymoon is ideal for couples seeking a sunny, tropical trip. Much of Anguilla’s offerings are soft, white sand beaches, but there are other activities for those who would rather not lie on a beach all day. From hiking to boating tours, an Anguilla honeymoon has everything that you and your partner could want from your honeymoon. There are plenty of places to grab delicious, fresh food. Being so close to the Caribbean sea, Anguilla restaurants are able to offer the best in fresh, local seafood. Aside from outdoor activities around the island, Anguilla offers world-class spa treatments and all-inclusive resorts. Receive a romantic couple’s massage or facial at one of Anguilla’s spas or resorts. Receive the pampering you and your partner deserve on your Anguilla honeymoon, one of the most beautiful islands in the world. Anguilla is warm year round, but unless you want to get caught in a hurricane, avoid June to December. Temperatures hover around 80°F for most of the year, but tourism to Anguilla peaks from December to April. During these months, you’re unlikely to find a deal on flights or accommodations. Additionally, crowds will be denser than if you visited during the off season from May to August, when you may experience a more private Anguilla honeymoon. Shoal Bay: A breathtaking beach with white sand and crystalline water—perfect for beach-seeking Anguilla honeymooners. Helicopter Tours: Many locations within Anguilla offer helicopter tours of the island. Scuba Diving: Anguilla’s beautiful coral reefs are perfect for scuba diving. Meads Bay: One of Anguilla’s most acclaimed beaches. Boating: Rent a boat or take a tour to relax on Anguilla’s waters. Nightlife: Take in Anguilla’s nightlife in one of many beachside bars and pubs. Bethel Methodist Church: This landmark is known for ancient stonework and friendly parishioners. The Old Prison: One of Anguilla’s few remaining historical sites. Swim with Dolphins: Discover these beautiful creatures with a boating excursion on your Anguilla honeymoon. Shopping: Explore local businesses and support the island economy. El Buen Consejo: Take a diving tour to explore this historic wreck. Golf: Visit Anguilla’s only golf course for a round on the green. St. Bart's and Anguilla honeymoon anyone been?